President Buhari at the Government Girls Science and Technical College (GGSTC) in Dapchi, Yobe State on Wednesday. 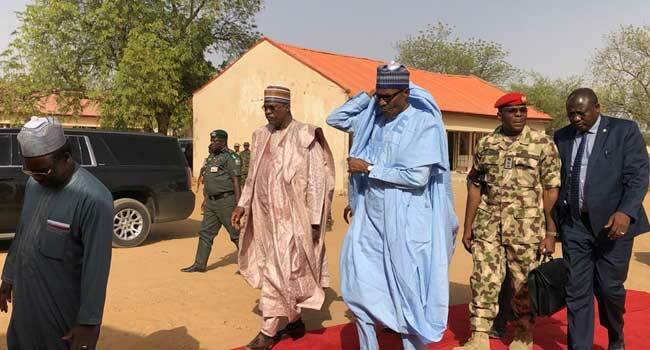 President Muhammadu Buhari on Wednesday visited Government Girls Science and Technical College (GGSTC) in Dapchi, Yobe State. 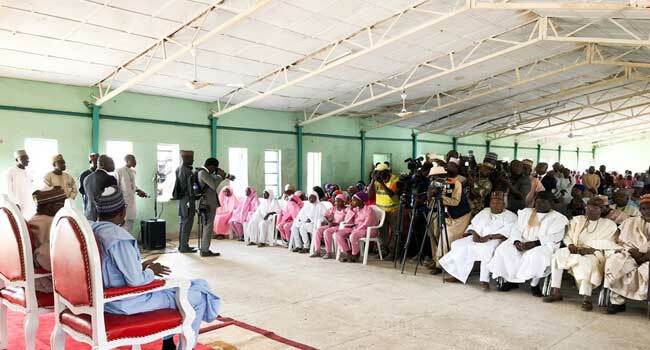 President Buhari during the visit held a meeting with parents and teachers of the GGSTC Dapchi where 110 students were abducted by Boko Haram insurgents. The President also met with community leaders at Dapchi. 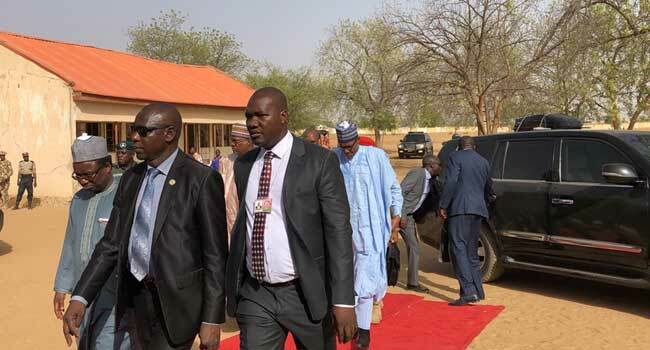 He earlier arrived the airport in Damaturu, the Yobe State capital as part of his visit to states affected by Boko Haram attacks and herdsmen-farmers crisis. During the visit, the President assured that the Federal Government will not rest until all the Chibok and Dapchi schoolgirls in the Boko Haram custody are released and reunited with their families. 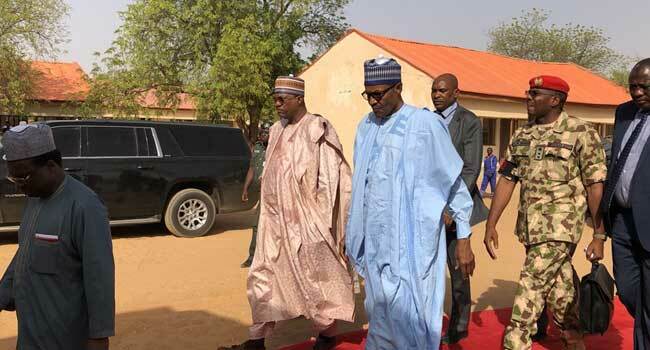 President Buhari arrives the Government Girls Science and Technical College (GGSTC) in Dapchi, Yobe State on Wednesday. President Buhari in a meeting with parents and teachers at the Government Girls Science and Technical College (GGSTC) in Dapchi, Yobe State on Wednesday. Cross Section of parents and teachers at the Government Girls Science and Technical College (GGSTC) in Dapchi, Yobe State on Wednesday. Some Boko Haram terrorists had stormed the Government Girls Science Technical College (GGSTC), Dapchi, and carted away with several students. 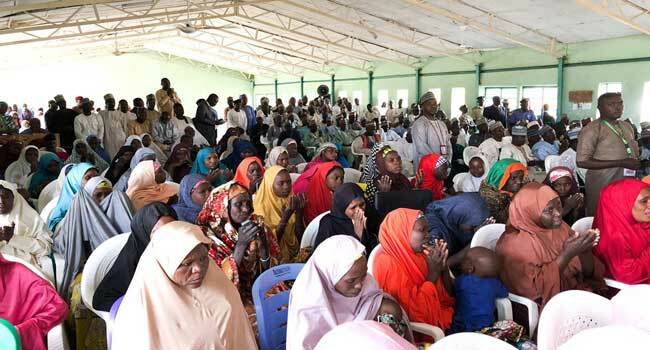 Following conflicting figures of missing students as a result of the invasion, the Federal Government confirmed that 110 girls were unaccounted for after the incident. Amid calls from Nigerians and international bodies, including the United Nations and the United States for the rescue of the missing girls, President Buhari explained what his administration was doing to ensure their safe return. He had also said the life of every Nigerian was important and vowed that the government would ensure the release of all citizens in the captivity of the outlawed group. He had visited Taraba (on Monday last week) and Benue (on March 12) where he condoled with families of those who lost their lives. States yet to be visited by the President are Zamfara and Rivers.